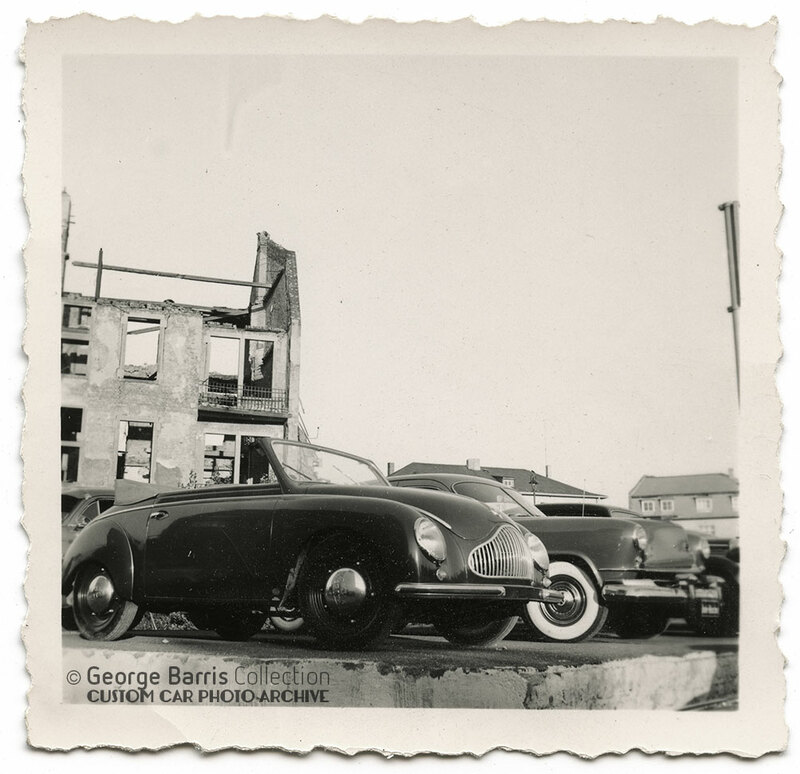 In 1951 George Barris visited several European countries for his design study trip. Italy, Germany and France were visited. And young George was seriously inspired and immersed himself in the European atmosphere. 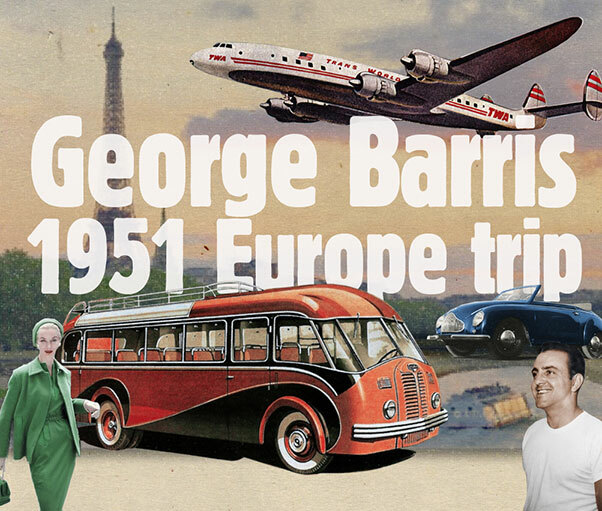 In late August 1951, George and his stepmother went on a European trip. The main goal for George’s mother was to visit her Greece relatives, where the Barris Family originated. 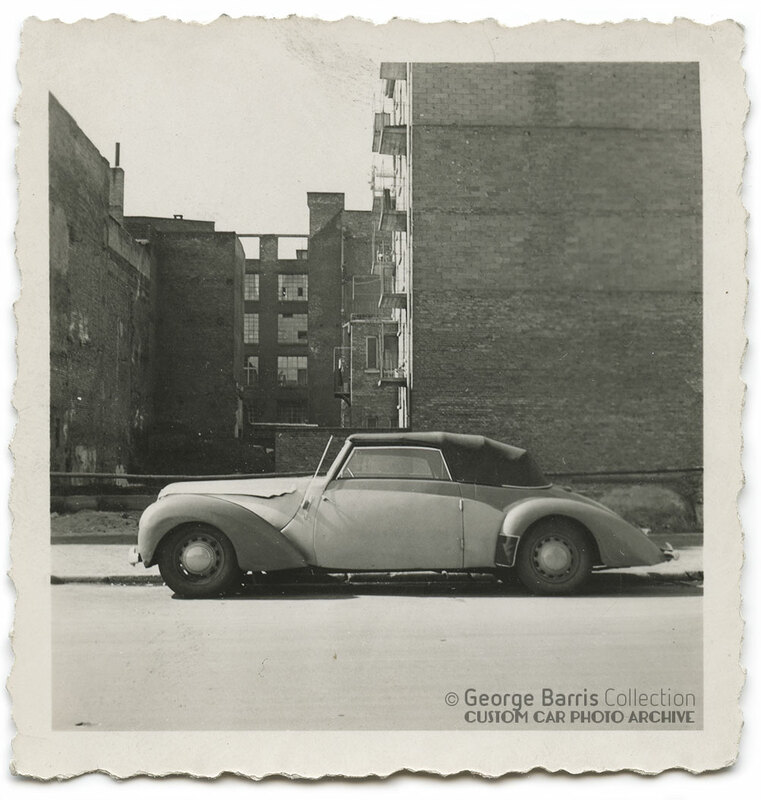 But for George the main goal was to get a good sense of anything European car wise, such as styling, customizing, designing, and so forth. George had made a seriously long list of coachbuilders in Germany, Italy and France. He wanted to visit them, and see for himself how they worked, what influenced them in their designs, and what techniques these European guys used. George took as many snapshots as he could, during this trip. 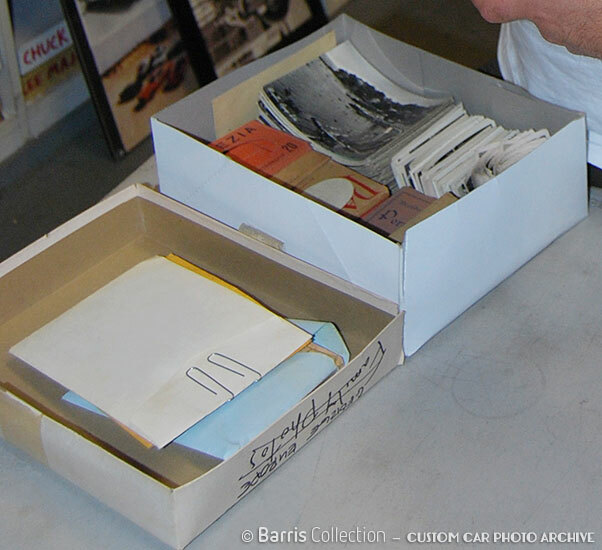 This resulted in a shoe-box full of photos he took, as well as a stack of pre-made local attraction photo booklets that were very popular at the time. Brett Barris browsing through the “George Europe” shoe-box, loaded with material George gathered from his 1951 study trip. 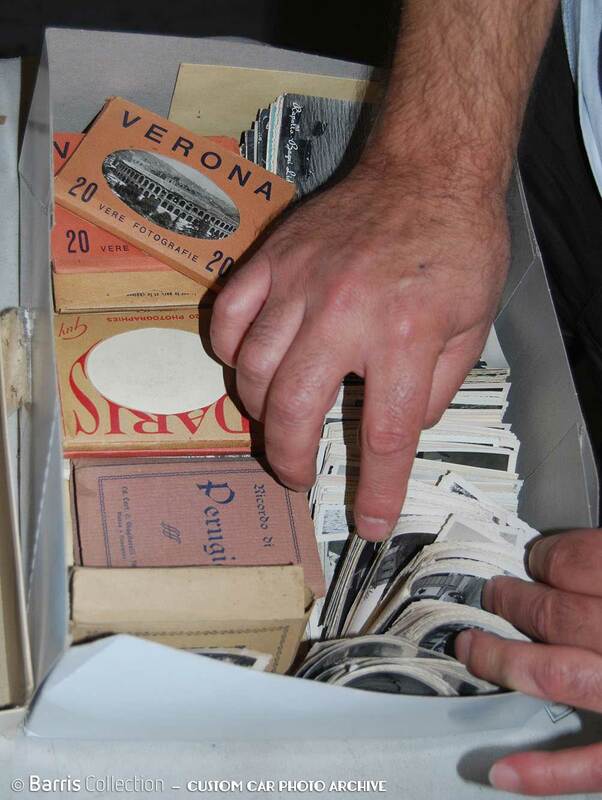 Some of the small booklet/boxes with “tourist” photos from some of the places George visited. 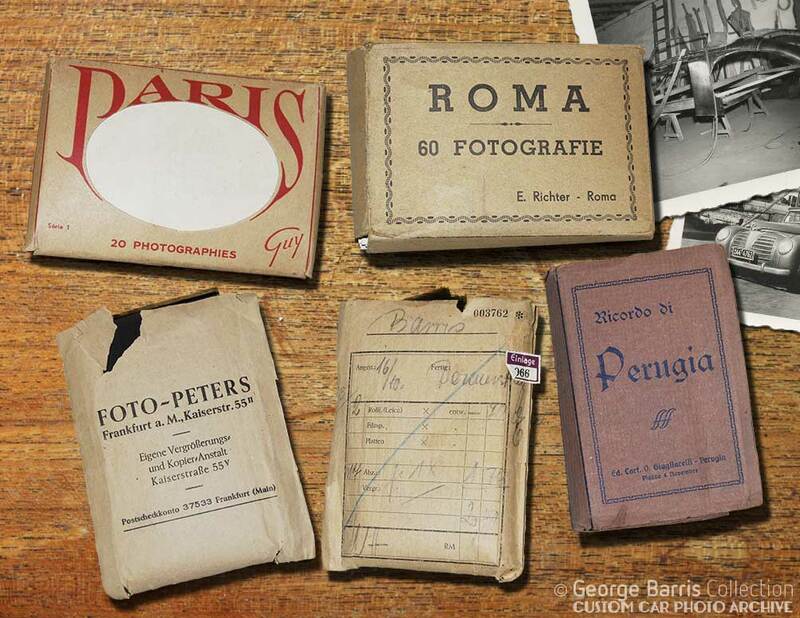 The two paper bags are filled with negatives of the many photos George took during this trip. Two snapshots George took of an a French Rosengart Supertraction, built between 1939 and 1947. It was based on the front-wheel-drive Citroen 11 CV “Traction Avant”. Perhaps he took this photo at one of his planned visits, or he might just have found it on the streets while wandering around. One of George his trips brought him to the the South German city of Stuttgart. Here he visited the coachbuilers shop of Karl Baur. 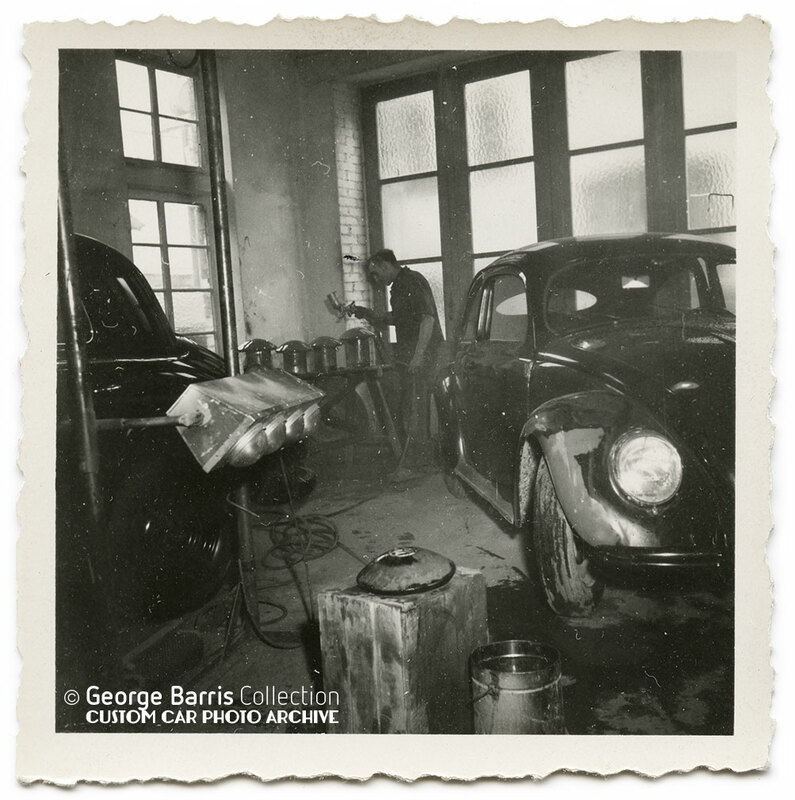 Karl Baur was responsible for creating most of the 184 Dayna-Veritas cars we can see in the photos below. This car was based on the French Panhard Dyna X, with a complete hand made body, and was produced from 1950 till 1954. The nice little sport car was available in convertible and coupe. 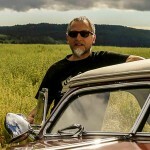 The car was produced for Veritas GmbH, Baden-Baden. 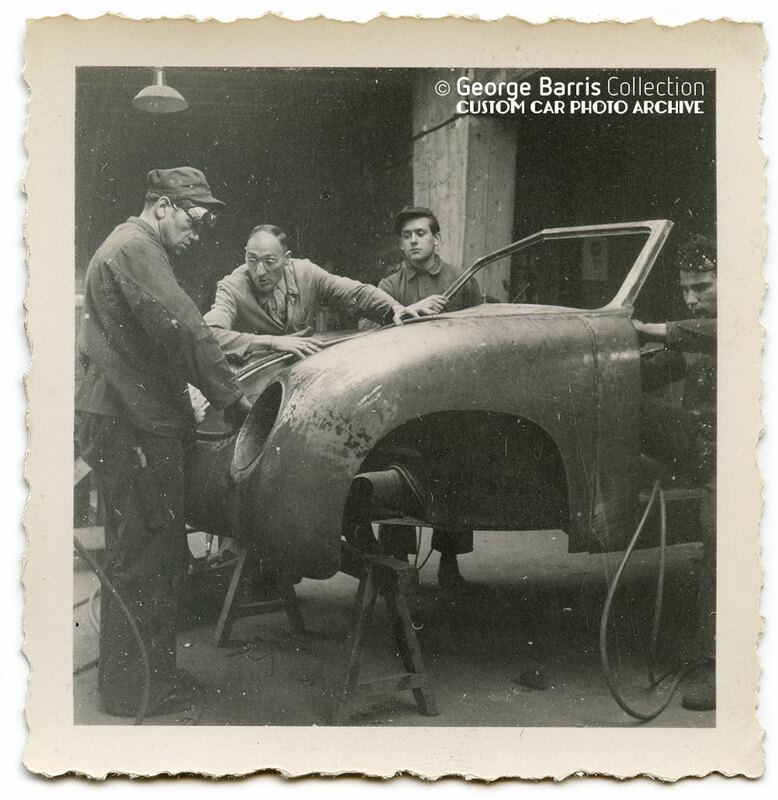 George took several snapshot, showing the process another German Couchbuilder, Dannenhauer & Stauss, also located in Stuttgart used, including some of the wooden buck they used to shape the main body over. A technique typically used by the coachbuilding companies. 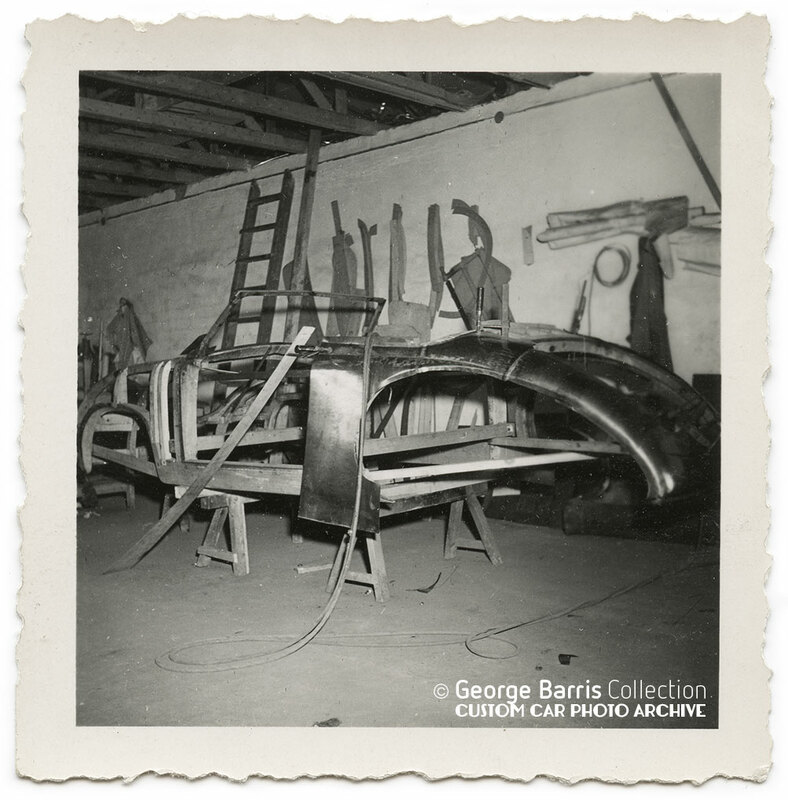 Barris had seen these techniques used at for instance California Metal Shaping in LA, where they build one-off bodies and panels. But never before had he seen these techniques being used on a production model. A finished Dayna-Veritas photographed close to the Karl Baur shop. 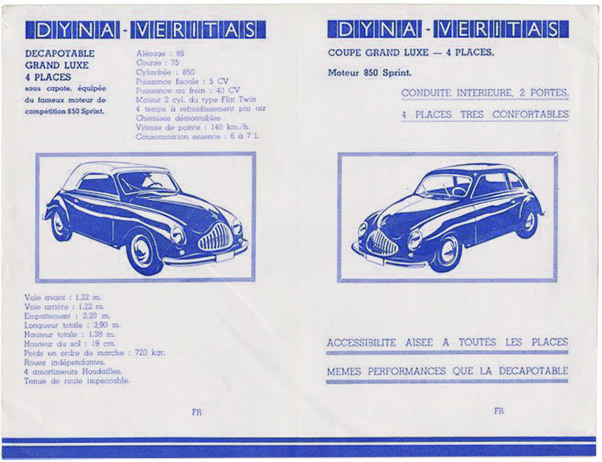 The inside of a French sales brochure for the Dyna-Veritas. This brochure showed both the convertible and coupe. The only body styles available. The in production snapshots below are most likely made at the Dannenhauer & Stauss shop. They manufactured their special bodies to fit on Volkswagen chassis in the early and mid 50’s. The models these Couchbuilders created were also an Coupe and Cabriolet. This snapshot shows a body being shaped on the wooden buck. This buck ensured the uniformity of the bodies. 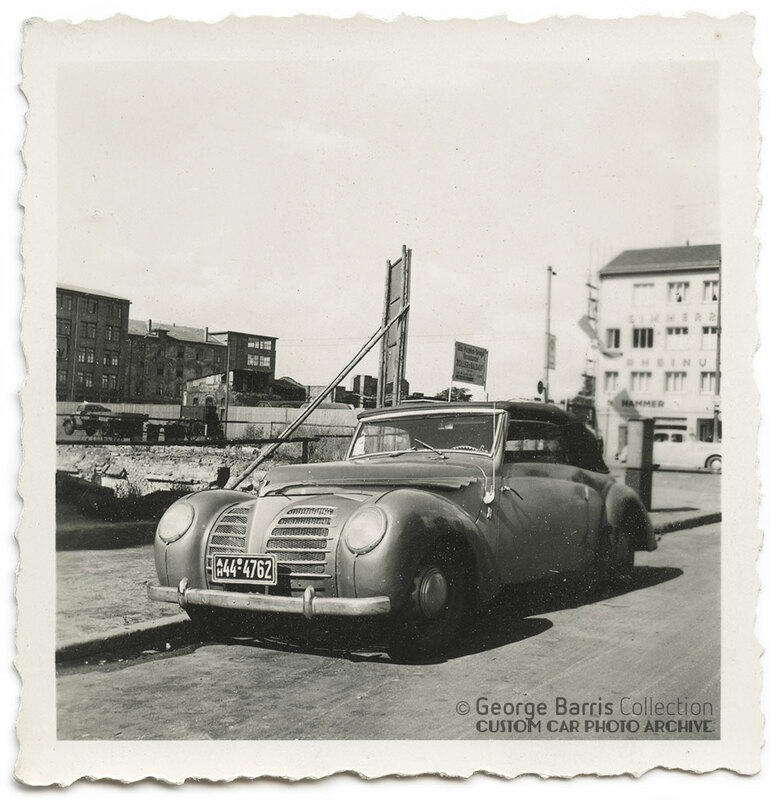 Besides visiting as many car related locations as possible, George also took time to enjoy the country, and especially the major cities. 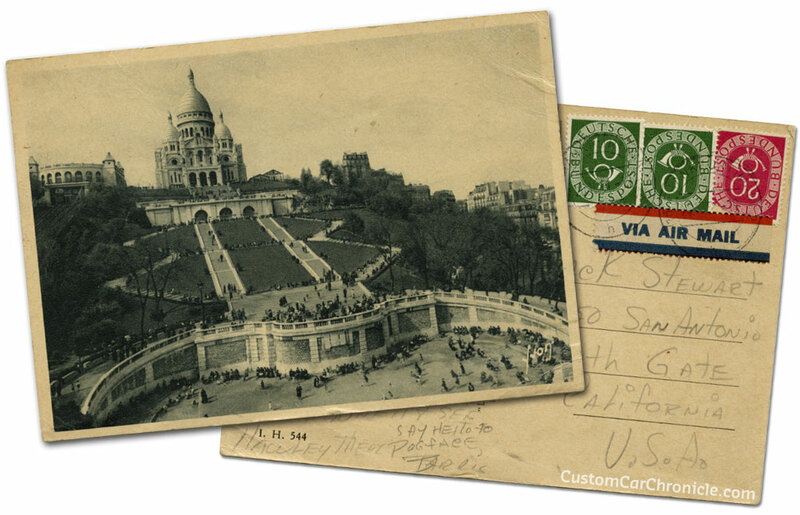 He wrote to Jack Stewart that he loved the “wonderful European ladies” and the fact that the clubs never seamed to close in the big cities like Paris. 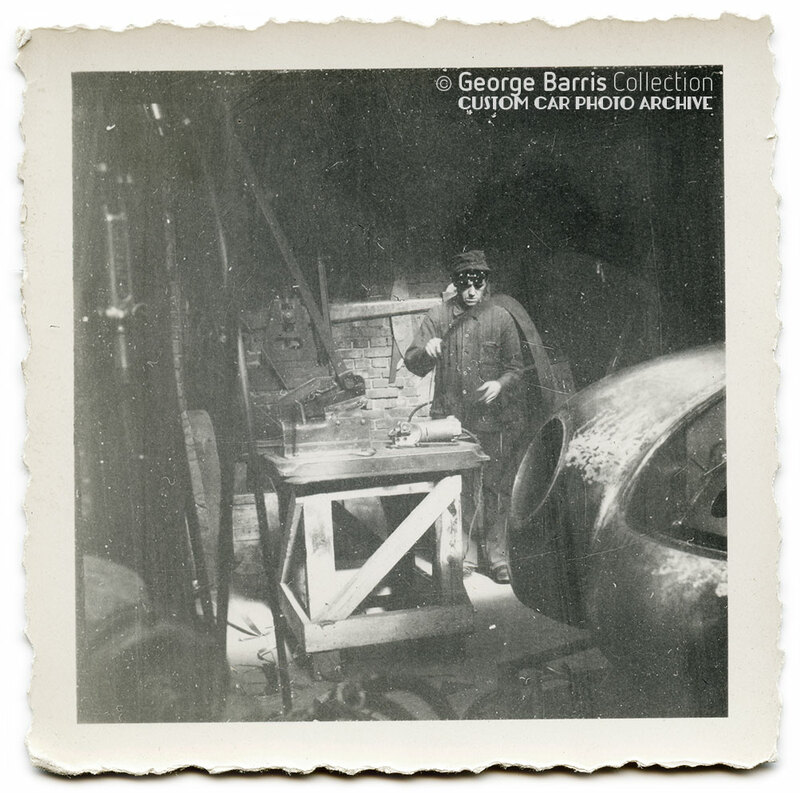 George returned home to Los Angeles in October 1951, his head full of ideas based on cars, and design samples, as well as work methods he saw during his study trip. 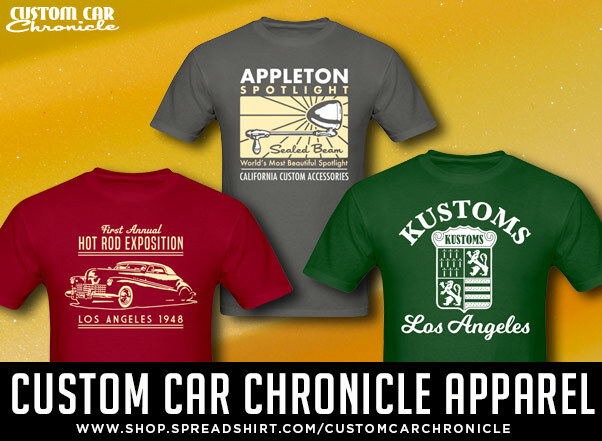 Go to part 2 of the George Barris Europe Design Study trip. 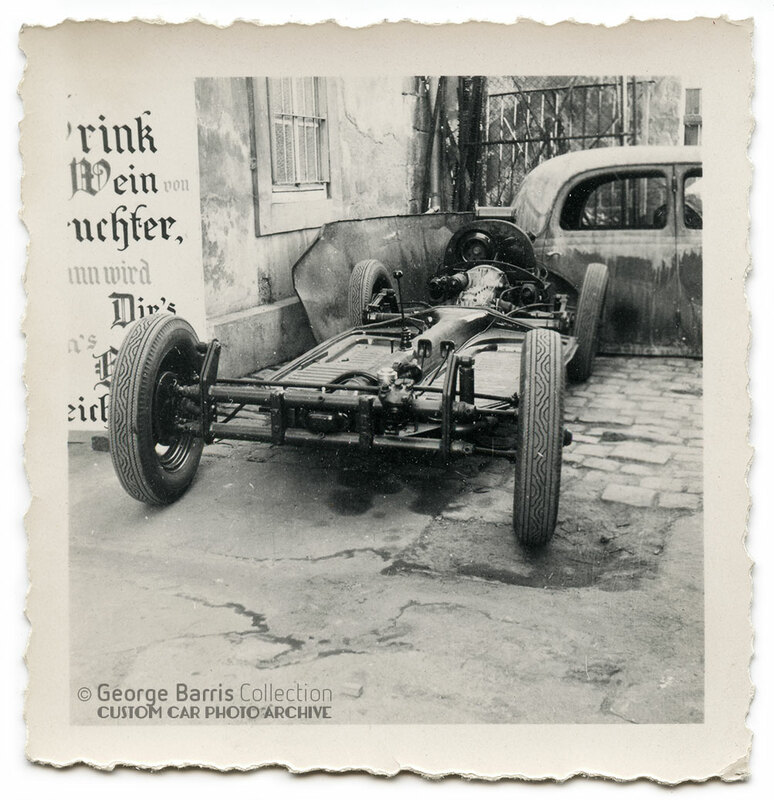 Those bodies on the pictures look more like Dannenhauer & Stauss bodies which were put on the VW Beetle chassis you see in the pictures also. The bodies on the pictures also don’t have a grill opening. However, I have some remarks: The “unidentified, most likely coach built, one-off car” is a french Rosengart Supertraction, of which about 1.050 were built between 1939 and 1947. It was based on the Citroen 11 CV “Traction Avant” with front-wheel-drive. Also, the Stuttgart coachbuilder’s name is Baur, not Baut, and the little sports car he built the bodies for is called Dyna-Veritas. It uses the mechanical components of the french Panhard Dyna X, again with front-wheel-drive, and with a 2-cylinder, 610 cc flat engine. The Dyna Veritas was the first car after the war that was jointly built by a german (Veritas) and french (Panhard) car make. In the next to last photo it looks like the guy painting in the background is using a gravity feed spray gun.Where they that far ahead back in 1951? Very intresting , this meens the Hirohata Merc was designed by George after this Europe trip , wonder if he incorporated any ideas found in over here ? The Dyna-Veritas appears to be a reasonably good looking small car, and I have never before seen any reference to them. Of course I’m familiar with the BMW-Veritas models which have been extensively covered by publications since they were current.